Growing up there were a few dishes that my grandma would make only for holiday meals or special family dinners. My sister and I looked forward to them and made sure to double check that they would be on the menu a week or so in advance of the meal. One of these recipes is known in our family as Yummy Potatoes. More than likely Grandma clipped the recipe for Yummy Potatoes from a magazine or newspaper column decades ago. 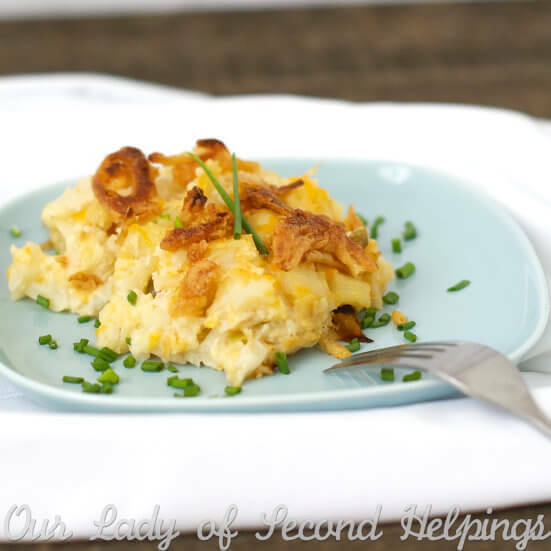 One bite of this bubbly, creamy, cheesy casserole and it is no surprise that we adopted it as a family favorite. The ingredients are not at all fancy or difficult to assemble but along the way we all decided to reserve it for special meals. Last Christmas my very wise aunt sent me a copy of Grandma’s recipe card and asked me to lighten it up for our holiday meal. I was happy to take on the challenge. I added a super secret vegetable in the form of diced cauliflower and made some simple swaps with the ingredients. I did not alter the volume of cheese. I did scan of all the packages of shredded cheese in the supermarket and found the 2% Mexican blend was the lightest variety that would get all melty in the oven. The lightened version of Yummy Potatoes still gets bubbly oven and every bite is creamy and cheesy. 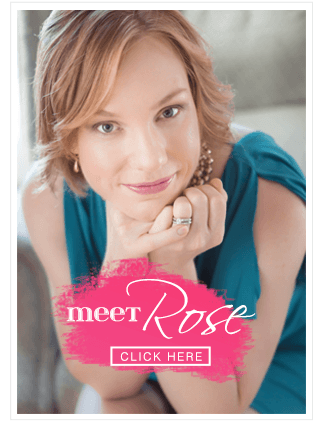 When choosing the menu for a special occasion I like to think not about “loving with food” but feeding my family with love and a respect for their bodies. I want my family to stay healthy and happy for many years to come and lightening up our favorite dishes is a great way to do that. The best part about this dish is how good it is any time of day. 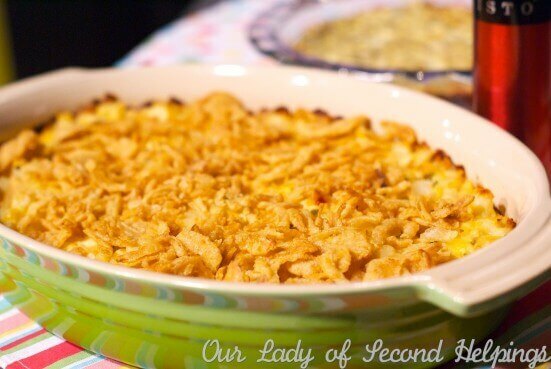 Make this for a special occasion breakfast, lunch, or dinner. 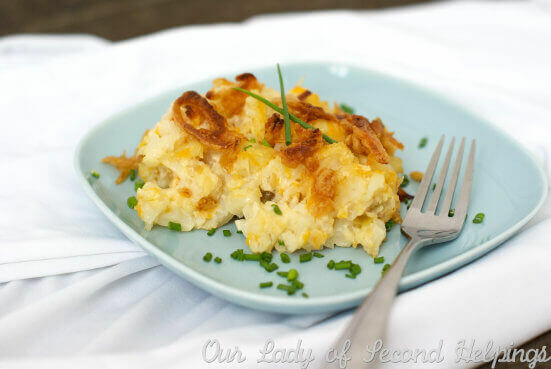 The creamy and cheesy potatoes are so satisfying and the crispy onions crust makes it over-the-top good. 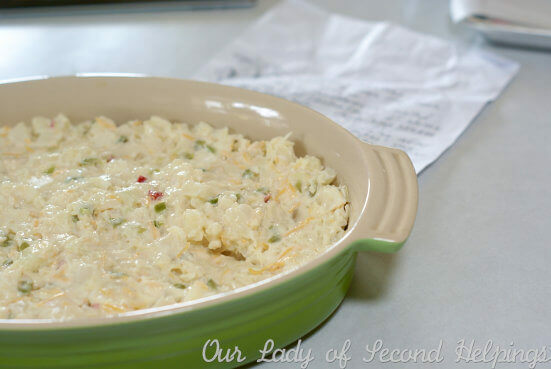 Add diced chicken or ham to turn this tasty side dish into a homerun entrée. Dice and steam the cauliflower. Combine the potatoes and steamed cauliflower in a 13 x 9 x 2 baking dish. Mix together the cream of chicken soup, yogurt, buttermilk, cheese, melted butter, and garlic salt. Cover with foil and bake in the preheated oven for 45 minutes. After 45 minutes remove the foil and top the potatoes with the fried onion pieces. Continue baking for 15 more minutes. I know that it serves 16, but what is the serving size? Thanks for asking Rachel. Unfortunately I don’t have notes for the serving size, I apologize. Off the top of my head I believe the servings are in the neighborhood of 1/2 – 3/4 cup each. Next time I make this I will be sure to update the recipe. If you make this, and I hope you do, I would sure appreciate knowing what you come up with. One more question, you mention garlic powder in the ingredients list, but garlic salt in the directions. Which did you actually use? It should say garlic powder in both places. Are “O’Brien Potatoes” a brand or a type of potato? If they’re a type, is it just the way they’re cut, or is there stuff in them? Also, are you supposed to use one pound of potatoes or twenty-eight ounces? Thanks for asking Ashley! O’Brien Potatoes are the style of potatoes not the brand. Look in the freezer section for small cubed potatoes. They are not seasoned but often have bits of bell pepper and onion mixed in. For this recipe you’ll want around 1 1/2 pounds of these potatoes. The package I used had a little more – 28 oz.